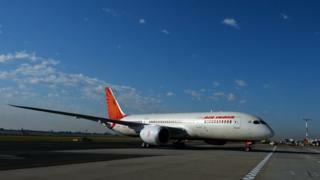 Air India has suspended its Birmingham Airport flights citing "operational reasons". New Delhi and Amritsar services in and out of the city are to be grounded from Saturday. Birmingham Airport called the move "disappointing" and said it was trying to restore the schedule. The change affecting four regular services is a result of closures to Pakistan airspace, the airline says. Pakistan airspace was restricted after air strikes by the Indian military. The suspended services are: AI113 Delhi-Birmingham; AI114 Birmingham-Delhi; AI117 Delhi-Amritsar-Birmingham; and AI118 Birmingham-Amritsar-Delhi. Before the change, Air India flew from Birmingham six times a week. The airline said its four daily flights through London Heathrow were unaffected, but its Madrid flights were suspended. On Twitter, the airline said it regretted "the inconvenience caused to our valued passengers" and suggested they would be entitled to a full refund. UK and Europe regional manager Debashis Golder added: "The flight cancellation is due to extraordinary circumstances namely closure of Pakistan airspace and resultant impact which is beyond control of Air India. "In fact besides Birmingham, many other flights in our network have been cancelled, combined or being operated with restricted payload, to reduce impact on passenger travel to the minimum." One passenger took to Twitter to say the suspended flights were a "huge blow to Birmingham Airport". An airport spokeswoman said: "It is naturally disappointing that Air India is temporarily suspending its services from Birmingham Airport to Delhi and Amritsar from 16 March 2019. "The airport is very understanding of the current situation which means that Pakistan airspace cannot be overflown and the operational impact that this is having on Air India. "Passengers that are already booked on Air India flights from Birmingham will be contacted by the airline to re-book or to gain a refund. "We are working closely with Air India to restore these flights to Birmingham Airport's schedule as soon as possible."